I'm pretty close to rainbowing all normal/hard dungeons but I'm having a hell of a time completing Labyrinth with Goatperson. It seems like the Titan Guitar is a required prep for this because otherwise the walls force you to overexplore, though with all the walls gone it can feel like a crapshoot finding monsters to eat. I've also tried it with the Amulet of Yendor but I've not had luck there either - I get to the boss okay (or rather, he comes to me) but I've not been able to kill him once yet. Any advice on preps? Right now I'm thinking Titan Guitar with Elite Shops and hope for Yendor, but that seems like a pricey scum. I also welcome any goatperson advice in general; I have Cursed Oasis, Ick Swamp and Magma Mines to go after this, not to mention the Vicious dungeons / Gaan-telet. Cursed Oasis isn't really that bad since the boss isn't particularly strong. You don't really need resists or anything fancy. Ick Swamp was annoying, I don't remember how I did it but it probably involved GG, I think. It's really hard to deal with the poison/mana burn plants without Cleansing. I don't recall having having many problems with Magma Mines. The usual strat (kill one of the bosses, then one-shot the other one) is still easily workable - especially if you find BLUDTUPOWA, the physical immune boss is quite easy to take out, and then you only need to land one shot on the magic immune one. After that you have one fairly weak boss which you can easily take out using all of your refills. In general, I usually prep Attack Boosters + Perseverance Badge, some god (don't get Conjunction, it makes the run more unpredictable), Yendor, Black Market, and whatever shop prep I think will help most. And compression seal, of course. Gods are a very important part for Goatperson. I like to prep Jehora, one of my favorite gods to warship, and very consistent and reliable (very needed for the Goatperson). He gives you bigger bars (great for Goatperson since he gets tons of refills) and gives you piety for converting food! This makes him an amazing piety farm and since you don't lose any piety when converting to another god, unless you're very short on food you should pretty much always be leveling up out of Jehora with 100 piety. Oh, and if Pactmaker is on the field, you can go nuts with the Spirit Pact as well. The only problem with Jehora is the initial punishments, but if you bring some potions it's not much of a problem. In particular, since I prep Yendor, the corrosion and weakening doesn't really bother me at level 5 as much as it can cripple a level 1 character. Pactmaker in general is a fantastic find since aside from Scholar's Pact and Spirit Pact both being extremely good for Goatperson (Scholar's Pact makes each level up refill and overheal your health bar which is a huge benefit for 10 piety), since you can't "convert to" the Pactmaker, you'll always know exactly which god you'll be converting to on a level up. This information is extremely useful - I was playing a run recently where I was waiting all game to convert into Dracul after getting him at level 1, only to flip between Binlor and Taurog over and over and not being able to ever make use of the bloodpools. 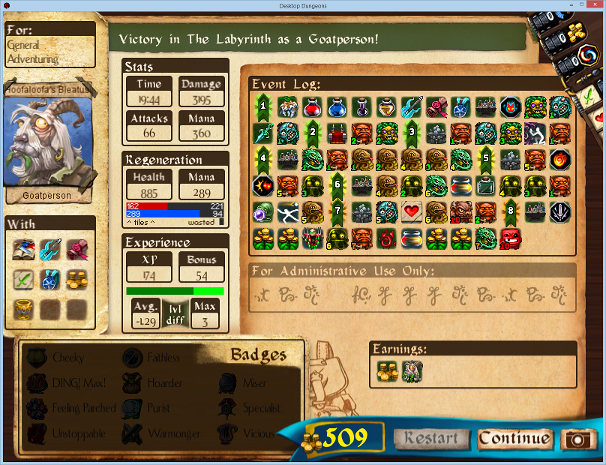 I don't think other preps can really beat Yendor - Goatperson's early game is just too difficult. The main point of Goatperson is to increase your stats - if you can get resistances, big health/mana bars, or a good attack stat, you'll get a lot more value out of your refills, which is pretty much the only thing the class really has going for it at the end of the day. This advice applies for most Vicious dungeons, I think. For Vicious Steel, it might be more worth it to take Binlor and Bear Mace instead. VGT is a totally different game though, I'm barely able to clear it with normal classes at the moment. Good luck with your runs! Goatperson needs it.